demonstrate to the coach and your teammates that you can "take a hit like a man;"
because you believe	that the glory of individual and team success, the promise of a college	scholarship, or the lure of a lucrative professional career, is somehow	worth the risk of lifetime impairment from continuing to play with concussion symptoms. "As long as I can still see and keep my balance. As long as I'm not feelin dizzy, head injuries are all right." "There was a time that I've gotten a concussion. I didn't think much of it, you know, just a headache, move on with it, keep playing. ... Got hit pretty hard, helmet to helmet, couldn't see, saw stars everywhere, just went back on the field, started playing again. Didn't, didn't need to tell anyone. I mean it's not like I was laying down, couldn't get up or anything. But I thought I was fine." Several years ago, a segment of HBO's Real Sports on high school sports concussions featured the tragic story of Ryne Dougherty, a Montclair, New Jersey football player who died in 2008, likely from second impact syndrome, when he suffered a blow to the head when he returned to play, despite having confide to teammates that he was still experiencing headaches from an earlier concussion. Indeed, an ESPN poll of players, coaches, parents and athletic trainers in 23 states  found that players like you - the ones whose brains are being rattled and who are putting yourself at risk of adverse long-term health consequences from concussions - are still the group least concerned about concussions. When asked whether, if a star player got a concussion, they would rather lose the state title game as he sat out than win it because he chose to play with a concussion, more than half (54.1%) of the 300 players in the ESPN survey said they would play the star compared to 9% of athletic trainers, 6.1% of parents, and 2.1% of coaches. A majority of players (55.4%) also felt that a headache - far and away the number one reported symptom of concussion  - shouldn't disqualify them from returning to the same game. It is therefore critically important, as an athlete playing a contact or collision sport (including not only football, hockey and lacrosse, but soccer, basketball, cheer, and baseball), that you understand the symptoms of a concussion (things you feel) as well as the range of damaging health consequences of not reporting them, from making another concussion much more likely  to long-term cognitive (concentration, memory, reasoning) and emotional difficulties (e.g. depression ) to catastrophic injury or death (e.g. second impact syndrome ). Not only do you need to report your own symptoms, but, if your teammates tell you they are experiencing concussion symptoms, you should urge them to report them to some responsible adult, whether it be the coach, athletic trainer, school nurse, or parent. By doing so, you may be literally saving their lives. It is also critically important that you NOT return to play before your symptoms have cleared. As anxious as you may be to return to the playing field, coming back too soon, before your brain has fully healed, will likely delay your recovery, but could have tragic consequences. Because your brain is still developing, a second blow to your head before your symptoms have completely cleared, not only at rest but with exercise , could lead, in rare instances, to an often fatal condition called second impact syndrome . One recent study   suggests that, if you are like most athletes, in gauging your own readiness to return-to-play you are likely to rely most heavily on the absence of somatic (e.g. physical) symptoms  such as headache, vomiting and visual disturbances - which are more apparent and easier for you or those around you to directly observe - and much less on the more elusive and subtle symptoms of concussion such as "fogginess," difficulty concentrating or remembering, and slowed reaction time - which are harder for you to detect. The study also found that, if you are like most athletes, your awareness of your own cognitive decline after concussion is limited. "The results of the study indicate youth athletes are basing their perceptions of recovery from concussion primarily on overt, physical symptoms such as headache and nausea, and may neglect to consider the cognitive symptoms of the injury, says lead author of the study, Natalie Sandel, B.S., then of the Department of Neuroscience and Dietrich School of Arts and Sciences at the University of Pittsburgh. Another recent study  found that about a quarter of athletes who report being asymptomatic after exercise - which is a prerequisite to return to play - scored significantly less than their baseline on neurocognitive tests of verbal and visual memory, so that, absent honest self-assessment of symptoms after exercise and neurocognitive testing, there is a risk that you will be allowed to return to play before your brain has fully healed. The bottom line: be honest, be smart, and, when in doubt, sit the game out! 1. McGrath N. Supporting the Student-Athlete's Return to the Classroom After a Sport-Related Concussion. J Ath. Tr. 2010:45(5):492-498. 2. McCrea M, Hammeke T, Olsen G, Leo P, Guskiewicz K. Unreported concussion in high school football players - Implications for prevention. Clin J Sport Med 2004;14:13-17. 3. Tomei KL, Doe C, Prestigiacomo CJ, Gandhi CD. Comparative analysis of state-level concussion legislation and review of current practices in concussion. Neurosurg Focus 2012; 33 (6):E11 (published online ahead of print)(accessed December 10, 2012). 5. Echlin PS, Skopelja EN, Worsley R et al. A prospective study of physician-observed concussion during a varsity university ice hockey season: incidence and neuropsychological changes. Part 2 of 4. Neurosurg Focus 2012;33(6):E2. 6. "Concussion Confidential" ESPN The Magazine (http://sports.espn.go.com/espn/news/story?id=5925876 )(accessed December 21, 2010). 7. Sandel N, Lovell M, Kegel N, Collins M, Kontos A. The Relationship Of Symptoms and Neurocognitive Performance to Perceived Recovery From Sports-Related Concussion Among Adolescent Athletes. Applied Neuropsychology: Child. 2012; DOI:10.1080/21622965.201 2.670680 (published online ahead of print 22 May 2012)(accessed June 5, 2012). 8. McGrath N, Dinn WM, Collins MW, Lovell MR, Elbin RJ, Kontos AP. Post-exertion neurocognitive test failure among student-athletes following concussion. Brain Injury 2013;27(1):103-113. 11. Chrisman SP, Quitiquit C, Rivara FP. Qualitative study of barriers to concussive symptom reporting in high school athletics. J Adolesc Health 2013;52:330-5 e3. 12. Delaney JS, Lamfookon C, Bloom GA, Al-Kashmiri A, Correa JA. Why University Athletes Choose Not To Reveal Their Concussion Symptoms During A Practice Or Game. Clin J Sports Med. 2014;0:1-13; doi: 10.1097/JSM.0000000000000112 (published online ahead of print with post-publication corrections, June 19, 2014). 13. Research Abstract. 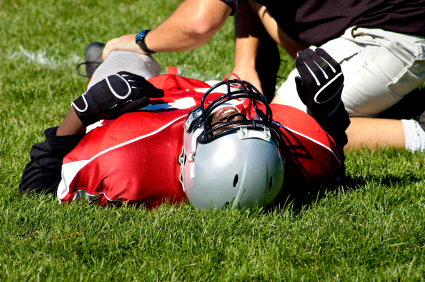 "The Reporting of Concussions Among High School Football Players, an Updated Evaluation." Minor JL, MacDonald J, Meehan WP. Presented at American Academy of Pediatrics National Conference and Exhibition, Washington, D.C. October 24-27. Honest self-reporting by athletes of concussion signs and symptoms, both their own and those of their teammates, and not returning to play until all symptoms have cleared both at rest and with exercise is critical for the short- and long-term health of youth and high school athletes.